Ella's Old Fashioned Momma: Yarn Along/Crafting On/Menu Plan? 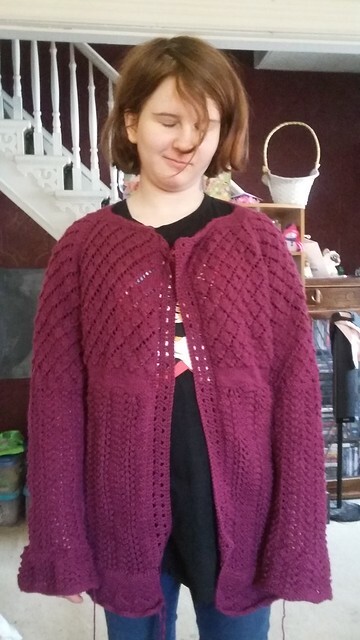 You aren’t going to believe this but the sweater is finally finished! Hopefully next week’s Crafting On will finally be a new project. Don’t mind the moody teenage model. I’m wondering if I should re-do the button bands, they seem to be a little tight? We’ve got a surprise trip to Pickering this weekend, so I need to get the ends sewn in and finished up. What’s on the menu this week? Nothing too exact. Today I’m making my slow roasted pork. That will give us leftovers for most nights. I also need to make up some food for Colin for the weekend.